TIGARD — The Westside Christian High School volleyball team will have a bit of a new look this season. This year our team looks very different from last year," Westside Christian coach Brittany Bowling said. 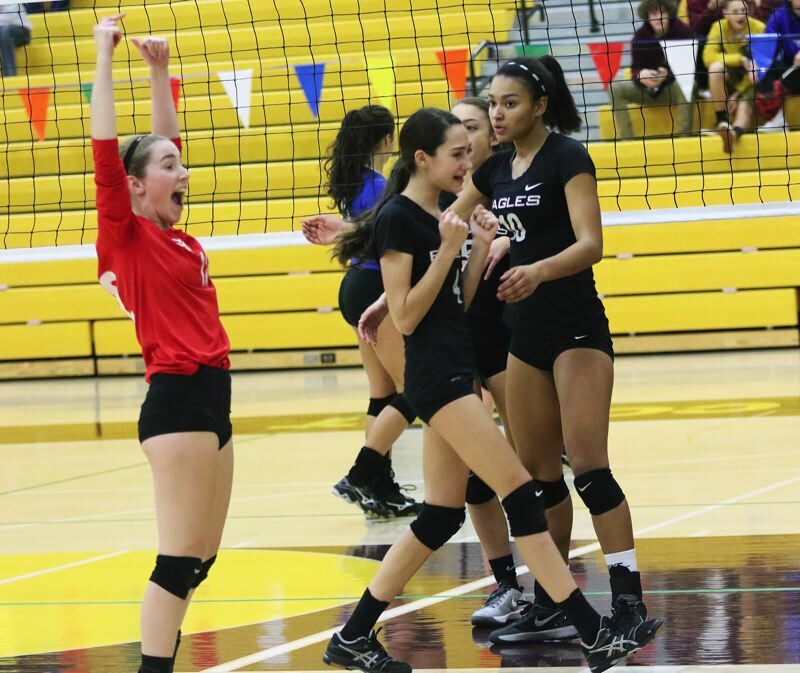 "Our libero graduated, and three other core varsity players (all hitters) transferred schools, so I wasn't sure what this season had in store for us." The Eagles' team this year is made up of all program returnees, including some returners from last year's varsity team that finished in sixth place in the West Valley League standings at 6-8, while going 9-12 on the season. Senior returnee Anna Gillingham will be playing at libero this season. Senior returnee Alyssa Molony will be at outside hitter/middle hitter. Also back are senior Eva Lammers, who will play at middle hitter, and Haley Shaver, who is the team's only setter. Junior Kayla Wooten will be playing left side, and sophomore Emma Molony will be playing outside hitter/middle hitter. "Haley Shaver and Anna Gillingham have stepped up as leaders early on this season and will be representing our team as captains," Bowling said. "I'm looking forward to seeing Kayla Wooten step into a new role as a left side player. She will be playing outside which she is new to, in the past she has only been a defensive specialist, and so far she is really impressive in the front row." Among the newcomers to the Westside Christian varsity are senior Breanna Forney, who will be a defensive specialist, and junior Kyra Hartigan, who will be playing the right side. Freshmen Katrina Koss and Keiran Christiansen, who both play setter/right side, will be swinging between the varsity and junior varsity teams. "Losing a huge chunk of our core rotation is causing basically every player to step up this year and do something outside of their comfort zone, but they are building team chemistry and becoming a really tight knit group which is going to help us throughout the season," Bowling said. The Eagles are also moving to the Lewis & Clark League this year. "We are stepping into a new league this year, so I'm not entirely sure where we will end up, but I feel good about this upcoming season," Bowling said. Westside Christian opened its season on Tuesday with by rallying to score a 13-25, 16-25, 25-21, 25-16, 15-10 league win at Catlin Gabel. The Eagles will be back in action on Thursday, when they host Portland Adventist Academy in a league match starting at 6 p.m.